Custom bronze pendant and included a necklace. The pendant is made from customer supplied image. It is oval in shape. The image of the fox and foliage rise above the background. A reverse mold was made of the image and transferred in positive to the bronze. The bronze was kiln fired to fuse the bronze. The height of the oval pendant is approx. 2 inches. 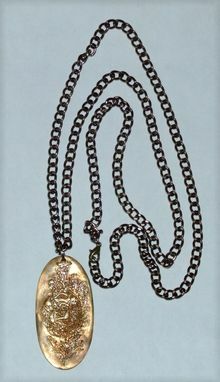 The chain is comprised of 6x4mm links 28 inches long. The Lobster clasp is 7x5mm. The connecting Jump ring is 8mm.